The U Street water main break. 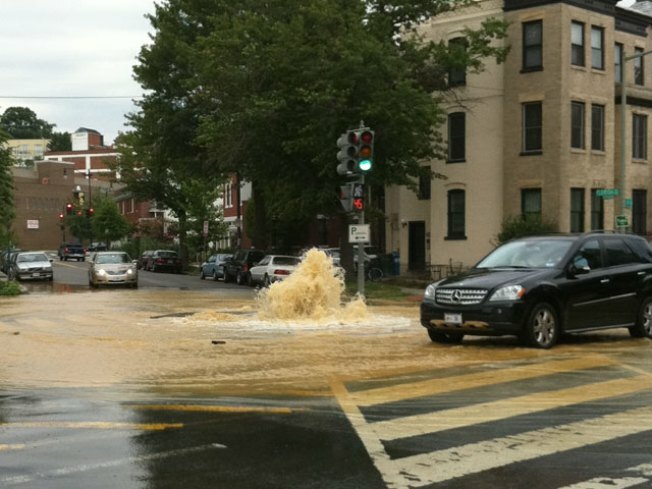 A large water main break flooded the intersection of 18th and U streets N.W. around 3:30 p.m. Tuesday. A 12-inch coupling blew off the bend to which it was attached. Crews were pumping out water and conducting repairs, with complete restoration expected around midnight. The eastbound lanes of Florida Avenue N.W. and U Street N.W. have been reopened. The intersection of 18th and Florida is still closed to traffic. Some businesses had shut down because their water had been turned off. People are advised to avoid the area. Fire department customer service units are were checking basements for flooding and structural damage, as well as possible electrical hazards. D.C. Water was also reportedly on the scene. "I was half a block away [from the break] and my car is so muddy it looks like I went offroading," an e-mailer wrote News4. Alan Heymann, director of public affairs for the D.C. Water and Sewer Authority, said scheduled valve replacement work was performed Monday night and the replacement malfunctioned, according to the Associated Press. Georgetown University Hospital was without water for approximately three and a half hours due to the water main break. The hospital employed its emergency response plan, and worked with D.C. Water and the fire department. Hospital officials say patient care was not affected. Water service has since been restored at the hospital.